Bags made from recycled truck tarps that have travelled Europe-wide. 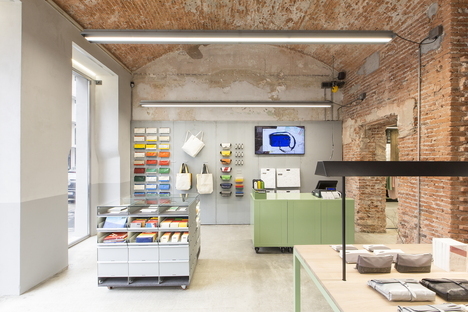 FREITAG bags have now burst onto the Milan scene, in an old industrial building in Viale Pasubio that has now been given a new lease on life. 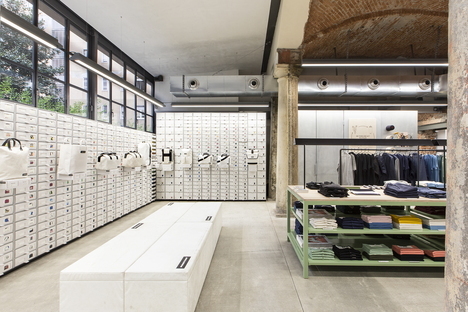 The Swiss brand FREITAG has opened its sixteenth flagship store - the first in Italy - in an old, 19th-century industrial building in Milan. It's located just a hop, skip and a step away from two major shopping streets in Milan - Corso Como and Corso Garibaldi - opposite the new Giangiacomo Feltrinelli Foundation designed by other Swiss compatriots, Herzog & De Meuron. 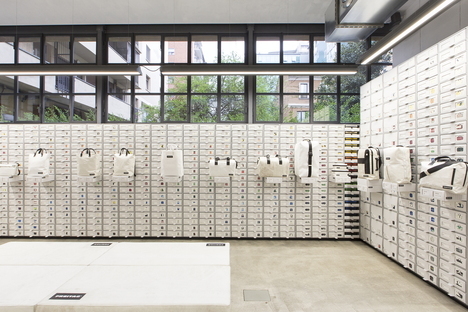 The first Italian FREITAG-Store is faithful to the principles of the two brothers who established the brand that makes bags and accessories from recycled truck tarps in their Zurich premises. In their former lives, these tarps travelled all over Europe and were in all likelihood part of the traffic on Milan's ring road. Now, not only do the bags recycle a tough old material but FREITAG has also given an old industrial building a new lease on life. 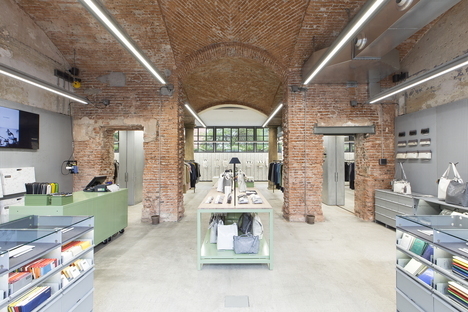 The ground floor of this old, 19th century industrial building, propped up by granite pillars and featuring vaulted ceilings was completely designed and completed by FREITAG itself, who have given an “unfinished” look to the patented shelving, bespoke designed to display more than 1500 one-off pieces, because each and every FREITAG item is made from different truck tarps. The biodegradable F-ABRIC clothing line has also been added to the range of bags and accessories - practically zero-mile here because they're made from flax and hemp fibres spun by a local weaver in Lombardy who is still the Swiss brand's supplier. 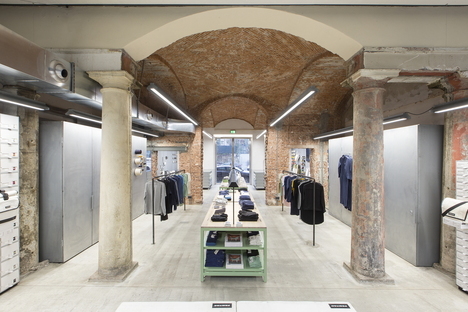 So, the first Italian FREITAG flagship store combines Swiss inventive with Italian artisan know-how in a narrative of creative reuse - from materials to places.